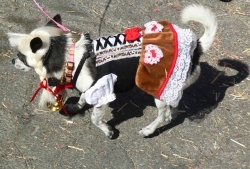 This was Pukall’s second time in the limelight, owner Sara MacGruder of Santee revealed.“Pukall was regional champion in the Chihuahua races,” said MacGruder, who also entered “Boeing”, a terrier mix masquerading as a grapevine. 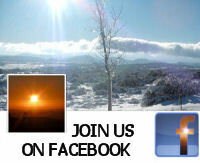 “We got Boeing from the El Cajon Animal Center. Her tag at the pound was 747,” she explained. 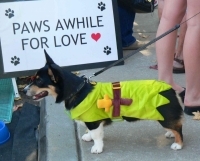 Third place was awarded to Wall-e, a Pembrook Welsh Corgi owned by Ave Harrison of El Cajon and aptly attired as Robin Hood. 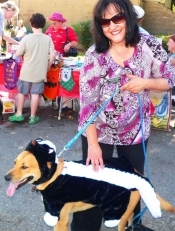 Even City spokesperson Monica Zech got into the Halloween spirit, bringing her own dog, Romeo, a Labrador-mix clad in a skunk costume. Romeo was also a former shelter dog, Zech said. Other noteworthy mentions included Evan Klein of El Cajon and his dog, Trigger, both dressed as Raiders fans, Chico, a long-haired Chihuahua in a chicken hotdog costume, owned by Michelle Ednilao of El Cajon, Arnold, a turtle-clad boxer owned by Tracy Reid of Hillcrest, and Maggie, a black Labrador wearing a ladybug costume stitched up by McCorkell, who also made the first place winner’s outfit. 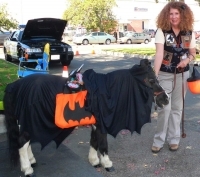 Stormy, a pony owned by Lori Roberts of Blossom Valley, delighted youngsters present with a Batman costume. Bill Pogue (“Pogonose”) and Jean Abbott (“Miss Suzie-Q”) of All-Star Clowns entertained children and the young-at-heart with their antics—including Pogue’s dog, Thunder, a Maltese. 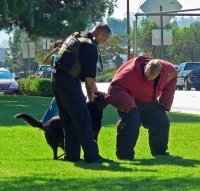 Officer James Bray, K-9 handler for the El Cajon Police Department, presented a K-9 demonstration complete with an attack by Wilco, a Belgian Malenious. 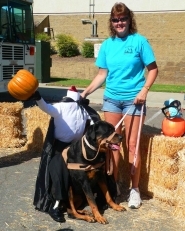 The Neuter Scooter was on hand to provide low-cost neutering of dogs and cats, by prior appointment. For information on how to schedule your pet for neutering at a future event, visit http://www.snap-sandiego.org/neuter_scooter.php. El Cajon Animal Shelter also offered low-cost vaccinations and animal adoptions.